SPAB member Mark Thomas writes about a local Berkshire landmark. This article first appeared in the summer 2017 edition of the SPAB Magazine. The magazine is only available to members of the SPAB. Alongside the A4 in Thatcham, Berkshire, is a small building now known as the Old Bluecoat School. Although it was a school in the 19th and early 20th centuries, the building’s history is much longer than that. The style of the east window shows that it was once a chapel and it is believed to have been built in 1304 as the Chapel of the medieval Borough of Thatcham. Living in Thatcham for over 30 years, I could not avoid noticing the rather tired old building by the side of the main road. Having a background in construction I volunteered to help the trustees during the refurbishment in 2014 and quickly got co-opted onto the committee. Like others before me, I started to investigate the history of the building and became fascinated by how the ancient building had survived through cycles of decay and repair. A Victorian historian, Samuel Barfield, discovered the original licence from the Bishop of Salisbury dated 3rd May 1304 granting a local landowner and later Lord of the Manor, Sir Richard de Fockenham, and the parishioners of Thatcham the right to hold chantry services in the chapel which they had already built at their own expense. Later authors speculated about why the chapel was built, although, from its location adjacent to the historic London to Bath road, one likely use could have been as a wayside chapel situated at the boundary of the newly created Borough. The promotion of Thatcham town to Borough status appears contemporary with building of the chapel and it is tempting to see the new chapel as a prominent civic status symbol for the new Borough. The national rarity of a surviving free-standing wayside chapel accounts for the building’s Grade 1 listing in 1983. Between 1304 and 1707 little is known about the chapel other than that, somehow, it survived. There is a single reference from 1446 saying that it is dedicated to St Thomas the Martyr. Another mystery is that there is supposedly no record of it at the 1547 Abolition of the Chantries during the Reformation. It appears in the records again in 1661 as “the Chapel of this Borough” almost as if it was still in use. The school closed in 1914 when the master was called up for military service. From the end of the First World War until 1964, Berkshire County Council rented the building for school cookery lessons. After 1964 the trustees of Lady Winchcombe’s charity could not find a new use for the building and its upkeep was unsustainable. It was sold to Newbury District Council in 1969 for £2500. The building was used as an antiques shop during the 1990s but fell empty again. In 2003, local Councillor Barbara Collins-Wootton, saw that the Council was proposing to sell the building by public auction as surplus to requirements. Mrs Collins-Wootton set up a committee with other Thatcham residents and succeeded in transferring the building to a new charity with a long lease from the Council to manage it for community use. After ten years of fundraising, and thanks to the generosity of local businesses, a start was made on refurbishing the exterior of the building in 2014. Modern cement render was removed from the flint walls and replaced with lime render and limewash. Temporary acrylic window panes, which had been there for over 30 years, were replaced with leaded lights in the original wooden frames and were based on an old photograph from 1897. The roof was re-laid, while saving 75% of the old tiles. Currently the interior is suffering from the 1973 refurbishment of cement rendered walls, a concrete floor slab and varnished plywood dado panels that cover up damp. The most striking feature is the attractive scissor-beamed roof. Described by some as Victorian or Tudor or, more credibly, as 15th century with an older tie-beam, the roof structure is an obvious candidate for more scientific dating. The building is now in daily use by local clubs and societies. Classical music concerts have been very successful, with many performers commenting on the excellent acoustics. Longer term plans, money and permissions permitting, are to refurbish the interior by removing the concrete floor and cement render and replace them with more appropriate materials. The challenge for a historic building in daily use will be to include sympathetic modern facilities, such as a catering area, so that the building is attractive to hirers and will continue in community use for the foreseeable future. For more information about the Old Bluecoat School pleases visit the website. Old buildings can be infinitely inspiring, we asked several women working in the conservation and heritage sector what buildings they find exciting and thought-provoking. We spoke to Rachel Morely, estate officer for the Churches Conservation Trust, Jane Kennedy, a senior partner at Purcell, and Gillian Darley, a writer on architecture. We asked Joanne Needham, SPAB caseworker, and Sam Peacock, a freelance stonemason what advice they would give to someone wanting to work in conservation. Here’s what they said. 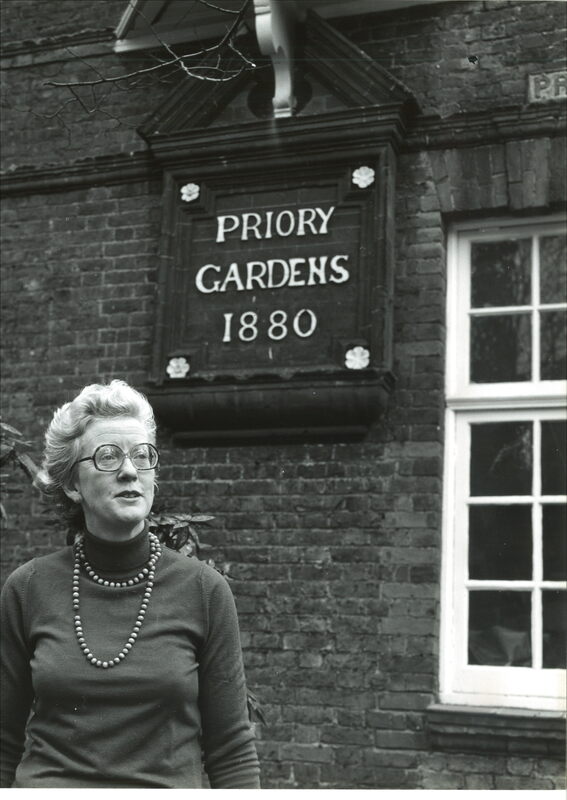 Architectural historian Hermione Hobhouse (1934-2014) had an extremely impressive career in campaigning for building conservation. She described herself as an urban historian and journalist, and she used her considerable connections and writing talents to lobby for historic buildings, most particularly in London. She was born in Somerset into a political family – she was descended from the social reformer Emily Hobhouse, who exposed the British concentration camps in South Africa during the Boer war and her father, the Liberal Arthur Hobhouse, played a key role in the establishment of national parks. After graduating from Oxford and working in television, her first book Thomas Cubitt: Master Builder (1971) won the Hitchcock Medal of the Society of Architectural Historians. This was followed by Lost London (1972), which was published at a time when there was a growing panic about the seemingly-mindless loss of historic buildings in London to make way for redevelopment. It is a fascinating book, filled with archive photographs exposing the loss of important buildings and a shared history irretrievably lost. Turning its pages you wonder, as Hobhouse does, “How much richer would London be today, if some control had been exercised over demolition in the past hundred years?”. What would a current edition include? Her introduction, an engaging and prophetic argument for preservation contends that “London is threatened with the grim prosepect of a Manhattan-like future, of becoming a city of the very rich and the very poor… the retention of historic buildings…can do a great deal to keep London human in scale”. On the demolition of Newgate in 1902 Hobhouse quotes the SPAB: “Those who have not already hear this will sympathise with us in our disappointment, and it really seems no building of value is safe in London”. She also decried the loss of public and open space, something which remains on the agenda for campaigners in London. This book, and her role of secretary of the Victorian Society from 1976 to 1982, did much to inform and stimulate the public about famous losses including the Euston Arch in 1961. Under her aegis, important Victorian buildings like Linley Sambourne House in Kensington were saved and opened to the public. Following her work at the Victorian Society, Hermione Hobhouse also served as general editor of the Survey of London between 1983-1994, which had been founded by CR Ashbee in 1894. In the 1970s she was also a tutor in Architectural History at the Architectural Association School. Her other published works included books on Regent Street, the Crystal Palace and Prince Albert. She was appointed MBE in 1981 and was a Fellow of the Society of Antiquaries of London.